A Rainforest Alliance Certified coffee. Finca Santa Barbara coffee is delicate and sweet with a hint of citrus that is light bodied. This Central American coffee is grown by the Menendez family of El Salvador at Finca Santa Bárbara, Santa Ana and Ahuachapán. The coffee features the Rainforest Alliance Certified seal, which guarantees that the coffee was grown on farms that meet demanding social and environmental standards as verified by experienced inspectors. The standards ensure that forests are protected, rivers, soils and wildlife conserved, workers treated with respect, paid fairly, properly trained and given access to education and medical care. 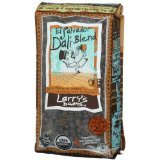 All of Larry's Beans are 100% Fair Trade, Shade Grown and Organic or Transitional Organic. And we have the first ever biodegradable coffee bean bag! A subtle sweet blend of South American coffees. Well balanced with a medium-light body and a marshmallow sweet finish. Founding member of Cooperative Coffees, the first and still the only group of independent coffee roasters that buys green beans directly from Fair Trade co-ops. Seven Bridges Cooperative Green Coffee Beans: Fair Trade Organic El Salvador San Mauricio Pipil, 2 Lbs. Seven Bridges Cooperative Green Coffee Beans: Fair Trade Organic El Salvador San Mauricio Pipil, 5 Lbs. A coffee from the highlands of El Salvador, the source of some world class coffees in the past few years. Those who grow this coffee suffered greatly from the civil war in El Salvador. Times continue to be difficult for these farmers due to the low prices of coffee, which is why the Fair Trade prices are so important. The coffee is organically grown under a rich canopy of shade trees, making the farms a sanctuary to many migratory birds and other endangered local species. The coffee has a rich flavor and fragrant aroma, with a pleasant earthiness and a hint of cocoa. We are committed to providing only Fair Trade certified green coffee. Purchasing Fair Trade guarantees the growers were paid a fair and living wage for the coffee they labored to produce. All of the green coffee we sell was purchased in small lots of only the best quality arabica beans. This green coffee must be roasted before it can be made into a coffee beverage. We recommend roasting with a home coffee roasting appliance such as the Freshroast Plus.